Translation from Dados – Revista de Ciências Sociais, v. 52, n.1, pp. 53-83, 2009. Dans cet article, on cherche à faire une évaluation qualitative du Programme Bourse Famille, sous la perspective d'une politique de redistribution du revenu et de développement. En analysant les principales caractéristiques institutionnelles du programme - l'accent mis sur les plus pauvres et les conditions d'éducation et de santé -, on y souligne une fragilité importante à propos de son économie politique qui peut mettre en péril sa durabilité en tant que politique redistributive et de développement. On suggère que des politiques de ce genre dans des pays où les inégalités sont trop grandes, comme le Brésil, peuvent rendre endogènes les limites de budget, de façon à nuireàla mise en uvredeleurs objectifs eux-mêmes. Deux directions alternatives sont brièvement présentées: la conversion du programme vers une politique hybride de politique ciblée et de politique universelle, et un accent mis sur la fourniture de services dans l'éducation des enfants. What can be learned from the recent Brazilian income redistribution experience? Is this really a case of development policy? The Brazil that emerged from the long developmental adventure is a big country that grew up under the shadow of being the "future's country". The somewhat paradoxical predicate may hardly be understood as a commendation, for the future insists in distancing itself as we get close to it: if it is true that, six decades after Stefan Zweig made his prophetic observation, the country figures among the ten largest world economies, with a high level in the Index of Human Development (IHD) and life expectancy at birth, it is also true that these successes are moderated because of their highly unequal distribution among the people. Economic inequality is persistently high, poverty, particularly among children, is alarming, and schooling and the average school performance are very low. As we know, Brazil occupies the last positions in the roll of more than fifty countries periodically subjected to the examination of school performance carried by the Organization for Economic Cooperation and Development (OECD). On the way to the future, president Luiz Inácio Lula da Silva implemented in 2004 an extensive national program of income transfer to the poor, the Bolsa Família [Family Stipend]. The country had experimented, during Fernando Henrique Cardoso's government (1994-2002), many shorter scale income transfer programs, including conditional programs focused in the poor, administered through different ministries. The first conditional income transfer occurred at the municipal level in 1995, in the city of Campinas, followed by the Federal District. During Lula's government, national programs were consolidated, enlarged, redefined and unified in a national income transfer program for poor families with children up to 15 years, Bolsa Família. In its creation, the program made explicit two objectives: reducing poverty and breaking up its inter-generational cycle. While the former would be attended to by the cash transfer, the latter would be attained through the education and health conditionalities: children should attend school plus participation in nutritional and preventive health programs, especially for small children and pregnant women. Chart 2 below sums up the program's characteristics. My purpose in this paper is to examine the program's performance, keeping in mind the redistribution and development aspects that constitute its objective, with particular emphasis on sustainability. It is essentially an effort to collect the available information on the program and reflect on the main obstacles to its sustainability. My questions are directed to the political economy of the Bolsa Família and were raised by recent facts of the country's political news. In spite of the program's large popular support, a recent expansion proposal was sternly attacked in the media and in heated debates in the Brazilian Senate. At the end of 2007, a forced contribution that was part of the funds for health policies was abolished in the Senate, without an alternative plan. Why did this happen? In which way did these new facts interact with the program? Did the program's institutional characteristics affect in some way its political economy? Could it be different? I advance that yes, it could be different; my main conclusion is that a redistributive policy that is also clearly developmental has better chances to be effective, besides appearing more legitimate (being, too, for this reason, more effective). In the next section, I comment briefly on the impact of Bolsa Família on the reduction of income inequality and extreme poverty in Brazil. The second discusses opportunities and challenges for the program's sustainability, including the continuing impact on inequality, as they were presented in the recent debate on the funding of social policies in the country. The third section deals with some of Bolsa Família's institutional characteristics that may impair the sustainability of its objectives. The following section analyses opportunities to expand the program's support. In the last section, I suggest a reorientation of the program in order to reinforce the developmental aspect it carries, pointing that child education initiatives should have a much larger emphasis than they have at present. The two main reasons for the fall of inequality seem to have been the behavior of labor income - a combination of expansion of the formal labor market and raises in the minimum wage - and social programs, especially Bolsa Família (Saboia, 2007; Soares, 2006; Hoffmann, 2005). The policy of increasing the minimum wage above inflation rates - adopted since Cardoso's government, although not as a governmental policy; continued and sped up during Lula's administration, now as a governmental policy - had an important impact on the reduction of wage and pensions inequality, and may be considered as the main determinant of the recent fall in income inequality in so far as wages and pensions represent the largest part of household income (Saboia, 2007). However, if we note that governmental transfers represent a small part of household income in Brazil, the Bolsa Família program appears as a relatively more important factor than wage and pensions variations. This program's specific impact in the 4.7% inequality fall from 1995 to 2004 is estimated in around 21%, while the fraction it represents in household income is only .5% (Soares et al, 2006). The significant effect on the total inequality may thus be attributed to the fact that a substantial number of people in the lower tail of the distribution complement their very small income with these monetary benefits. 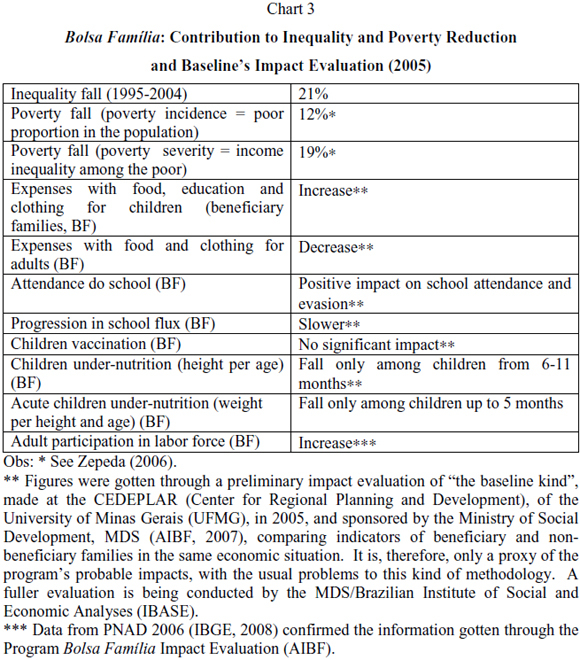 As to poverty reduction, if we consider the poverty baseline established in the program, the effects of the benefits on poverty incidence (proportion of the population that gets an income below the baseline) is not especially important.5 This result reflects the eligibility rules of the benefits size. In other words, the eligible families, classified as very poor and poor, get transfers because of poverty intensity and the number of children, but the transfers are not sufficient to remove them from the poverty condition. Transfers represented, however, an important mechanism of poverty relief for very poor families and may have had significant effects on children under-nourishment (Soares, Ribas and Osorio, 2007). In fact, estimates suggest that 87% of the transfers were used by families to buy food (Duarte, Sampaio and Sampaio, 2007). Many impacts of the program are summarized in Chart 3, below. The program's influence in the reduction of inequality was often commented and celebrated in the country and may account for its popularity. However, it is worth questioning if inequality will keep sustainably falling if the program continues or even extends to include youths of 16 and 17, as projected for 2008. The impact's continuity seems doubtful, unless the program emphasizes its equality of opportunity aspect, and that will be discussed in the next sections. IS THE IMPACT ON INEQUALITY SUSTAINABLE? Problems relative to Bolsa Família's political economy were raised in 2007 in the wake of two contrasting facts appearing in the country's political news. The first was an opinion poll that showed an increase in President Lula's and his government's popularity (in the beginning of the second term in office, immediately after the turbulence around the mensalão scandal**) (CNT/Sensus, 2007). According to the poll, while the President was approved by 65% of the population, his government had the support of near 50% and, while the approval rate among other economic strata was well above 50%, among those with income above ten minimum wages - middle and higher class individuals that in previous polls were less supportive of the government - surprisingly 46% also approved the government (answering "good" and "very good"); only 30% disapproved it. Part of the President's and his government's support derives from the country's economic performance; social programs, especially Bolsa Família, seem another part of the story. We may grasp the contribution of Bolsa Família to the government's positive evaluation from the results of another opinion poll, conducted also in 2007, that specified the program in the questions on government's evaluation (see Encarte Tendencias, 2007). According to that poll, 79.5% of those receiving Bolsa Família approved the government. That figure is slightly lower, 72.8%, in the evaluation of those who didn't benefit from the program but knew someone who benefited from it; and significantly lower, although still high, around 46%, among those who neither benefited from it nor knew anyone who did. It is worth noting that the latter figure coincides with the proportion of adults with income higher than 10 minimum wages and approved the government in the former poll. In the latter, the support for social programs is clear: although only 15% of the population benefits from them, 66% of the sample considered the programs positively and only 27% of them were negative. This fact, for which I only have indirect evidence, could be interpreted as an expression of solidarity Brazilian style. Apparently, however, it was not perceived in the analyses of social programs. Another line of resistance, adopted mainly by opposition leaders in Congress was the political argument that the program had electoral intentions being, in the last analysis, motivated by the President's and his party's desire of remaining in power, and this included winning the 2010 presidential contest. All these critical propositions are certainly open to empirical investigation and may represent more or less serious challenges to the program. Let's take, for instance, the problem of the true motivation behind governmental actions - knowing and denouncing them is important, in so far as it materializes itself in problematic practices in the project, implementation or monitoring of social policies. Up to now, however, there is no evidence of the clientelistic use of the stipends by the federal government and this is evidently related to the fact that the implementation and monitoring of the program, besides decentralized, include many checking points and abundant public information. The support for the other criticisms is far from conclusive. In some cases, it is not even clear what should count as evidence, as described by the debate on the program's effectiveness (I will go into it in the next section). In other cases, against the expectation that the program could generate dependence, data from IBGE (2008) reveal that adult participation in the labor market is higher among the program's participants than in the remainder of the adult population. But the limitation of "exit doors" is generally acknowledged as an important problem. Anyway, except for the arguments on opportunity costs (taken on in the last section) and on the political use, the criticisms may be seen as potentially constructive. A more significant threat to the program's continuity emerged recently, when the Senate rejected the government's proposal of maintaining a compulsory contribution, CPMF,10 which was part of the funding of Bolsa Família, besides representing an important source for the expansion of health public programs. At the time of the Senate's rejection, estimates suggested that the end of the contribution represented the loss of more than US$ 20 billion - around 10% - of the social budget. The event was indeed very dramatic, as intense preferences were involved. At the occasion, government representatives, on the one hand, observed that the suppression of the tax would damage public investments in the "exit doors" of social programs, besides representing the loss of an important instrument for the control of cheating on tributes, for the contribution covered virtually all financial movements in Brazil. On the other hand, opposition party leaders answered that government, besides being large, was ineffective and that more effectiveness would compensate the loss of resources. They observed that the revenue from the contribution ran the risk of political manipulation on the part of the government, for it would be destined to programs that would enhance the electoral performance of the Workers' Party (PT). They argued, finally, that the CPMF was a regressive tax. That question on the regressive character of the contribution occupied a large space in the media in Rio de Janeiro and São Paulo - which was surprising. A closer analysis of the arguments reveals that, at the time of the senatorial decision, nobody cogitated, within the Senate, about another mechanism to replace the lost revenue, as the contribution's rejection represented a concrete threat of stagnation for existing social programs, for it impaired the planned and announced expansions,11 leaving to the executive the conception of alternatives. If any set of initiatives could compensate for the loss of the contribution is irrelevant for this paper, as in the debate in the media and the Senate no alternative was publicly mentioned to this end, besides the vague and obviously insufficient austerity recommendation. As to the complaint about the program's evident electoral appeal, it is worth observing that two of the probable contestants from the ranks of the major opposition party (governors of São Paulo and Minas Gerais) publicly supported the government's initiative to maintain the contribution, challenging their party's leadership and in opposition to their peers in Congress. As possible occupants of the presidential seat, they seemed not to be interested in burning financial bridges to a political gain, the social programs. Finally, in what refers to the regressive character of the contribution, what comes as a surprise in the argument is that this characteristic of some taxes was never reason enough to suppress taxes in Brazil. In fact, the Brazilian tributary system rests solidly on indirect taxes, typically regressive, and up to the present nobody seemed very annoyed for this.12 The government sent to Congress a proposal of tax reform, but even its party, the Workers' Party, does not appear to be devising a concrete mechanism to turn the system into something more progressive. Apparently (and unfortunately), the progressive cause has no sponsor in the discussion. If in spite both of the existence of a short term alternative and of the pressure of electoral logic, and even in spite of the traditional lack of interest relative to the regressive character of the tax system, the CPMF was rejected, what was the rationale of this decision? A possible answer is that the debate on the contribution revealed again the Brazilian distributive tension, the confrontation of symmetrical interests and expectations.13 This is my second stylized fact: the debate about the CPMF was a battlefield where the Brazilian distributive conflict manifested itself. The fundamental opposition (while not openly declared by their members) was that between the interests and expectations of those who benefitted from social programs and those who did not (plus some fiscal evaders). If we oppose both stylized facts to each other - solidarity Brazilian style and distributive tension - we must inevitably ask if the conflict over the contribution would in some way anticipate a reversion or saturation of the solidarity indirectly revealed by opinion polls and would constitute a permanent challenge for social programs (especially Bolsa Família), their continuity and necessary expansion. In the next section, I will examine the shrinking potential of the program (the risk of losing solidarity); in the following section, the chances for its improvement (the plausibility of it gaining a growing or at least stable support). My central hypothesis is that the process of preference formation relative to taxation is at least partially affected by social programs and their practical pedagogy. Let us now observe the basic institutional characteristics of Bolsa Família as a redistributive policy - the focus on poor people and the conditionalities relative to education and health - in order to reflect on its influence on the program's stability through the "political economy" connection. In other words, how do these characteristics get back on the program and its political economy? In terms of resource transference, we say a program is perfectly focused if it contemplates all the eligible persons and only them. This is the primary efficiency definition of focused programs. In practice, however, that objective is never reached, and decision makers face the choice of either accepting undue inclusions (leakages), or undue exclusions, or a combination of both errors. This well known fact about income transfer programs generates the need for a secondary definition of efficiency. Predictably, however, any secondary definition involves problems of fairness. For instance, if decision makers choose minimizing inclusion errors, they will probably have to accept a less extensive program and will end up in the exclusion error, a paradoxical result if we keep in mind that such program's objective is to eliminate poverty.14 If, on the contrary, they tried to minimize exclusion errors, they will expand the program, running the risk of including non eligible people. If they finally choose to hit the target, they will have to spend resources to keep a reliable and updated register of all eligible people, and exclusively them, what would represent a deviation of resources that could be better spent in the program's expansion. Therefore, from the perspective of fairness, the choice of a secondary, practicable, definition of efficiency is not neutral. Based on data from the 2004 national household survey (PNAD), Soares, Ribas and Osório (2007) estimated that the Bolsa Família presented an inclusion error around 49%. It is worth noting that most of these people are not well above the program's poverty baseline: according to IBGE estimates (2008), based on the 2006 PNAD, the average household income of those who receive the stipend is below half a minimum wage. The program's exclusion error, estimated by Soares, Ribas and Osório (2007), was of incredible 59%, an extraordinary proportion of people. A more recent estimate, based on the 2006 PNAD (IBGE, 2008) points to the still extremely high proportion of 46%. From an international perspective, compared to similar programs, particularly the Mexican Oportunidades,15 the Brazilian program has a larger inclusion error and a shorter exclusion error, being a much bigger program (Soares, Ribas and Osório, 2007). But taking into account its objectives - reducing poverty and breaking up its cycle - the program is clearly insufficient because of its expressive exclusion error. The nature itself of a targeted program has certainly something to do with this disheartening result. In fact, there are a good many reasons to understand why so great a proportion of eligible people remain outside the program's reach. Initially, we must note that the target's reach depends on the persons presenting themselves and declaring their poverty to the local government. In many cases, these people do not even have information on their rights and, therefore, on how to be eligible for the benefit. Paradoxically, the poorer people are the most difficult to reach by the policy focused on them. In other cases, some eligible persons could choose avoiding the stigma of living out of social benefits; the fear of long term dependence seems real, considering that the program has not been able to grant exit doors. A third possible cause are errors in the register of beneficiaries, based in a mix of information provided by local governments and statistically treated information provided by the Instituto de Pesquisa Economica Aplicada [Institute of Applied Economic Research] (IPEA), mechanism that may not be able to eliminate clientelistic opportunities on the part of local authorities. In addition, the selection of beneficiaries is made from the register that, being a portrait of poverty at a point in time, does not grasp situations of poverty risk. A last reason is - and it comes as no surprise - pure and simple budget restriction. The latter obstacle to the program's effectiveness deserves special attention. The problems previously mentioned are those classically related to transfer programs targeted on the poor (lack of information among the poorer persons, stigma, poverty dynamics, opportunities for clientelistic action) and have been pointed to by some critics of this kind of policy, but budget limitations have been generally absorbed as a fact, regardless of the adopted policy. I will develop an alternative perspective on the question of limited budget that has not been raised in the Brazilian public debate. It is reasonable to assume that, if the Bolsa Família program is oriented mainly to poverty reduction, keeping its design, budgetary pressure will continue strong. The point is obviously empirical and open to test, but it seems not only plausible but also probable, if confronted with the recent debate over the CPMF. The underlying idea is that targeted programs tend to reinforce attitudes that weaken solidarity instead of strengthening it. The connection of these elements is people's disposition to pay taxes to fund social programs. Many factors determine the disposition to pay taxes. To put it simply, we may describe them as a mix of self-interested and non self-interested motivations, a mix for which we have indirect evidence in the Brazilian case, as was presented above. The point is that this mix may be affected by the philosophical orientation of social policy and this, in its turn, may end up affecting the policy's own effectiveness. In other words, social policy's style is not neutral in relation to preference formation: it may influence people's attitudes and preferences. Targeted social policies may weaken the disposition for paying taxes to fund them through the segregation principle they carry, according to which "some pay while others are benefited." If the policy is perceived this way, it must count with a very strong solidarity (almost irrational), that the policy tends to defeat as it reinforces segregation. That idea does not presuppose that people are naturally self-interested, but that solidarity requires at least a sense of identification or sympathy with the beneficiaries, which is, however, undermined by segregation. If this is so, the result may be the well known redistribution paradox, on which there is relevant evidence:16 income redistribution policies tend to redistribute less than universal income policies for there is a tendency for there being less to be redistributed. As we saw above, in section two, public debate in Brazil has been registering negative signs with regard to the social budget expansion. Both critiques to Bolsa Família's projected expansion and the Senate's rejection of the CPMF's continuity are important indications. Influent specialists in social policy have argued, in face of restrictions, that the program should seek more efficiency: delivering better results in terms of poverty reduction per monetary unit of a given budget. This recommendation sometimes comes along with another: generalizing, for social services (education and health) the focus orientation already adopted by income programs, channeling when possible services exclusively to the poor.17 However, the exclusive focus on logistics may overlook the point that the budget is not given, but to a good extent endogenous to the policy's orientation. We must keep in mind that, in order for the program to survive, it needs to be expanded at least for fairness reasons: besides including youths 16 and 17 years old of the beneficiary families, it should also include persons unduly excluded, and this will not result from the sole exclusion of those unduly included and from additional administrative expenditures in a perfectly reliable register, because of inevitable trade-offs; but the program has to be expanded for other reasons than fairness. In order to be faithful to its explicit objectives - reduction of poverty and breaking up of its cycle - it will need a lot more resources, to be invested in the crucial provision of services (training and qualification for work, education and health). As to services expansion, up to now there was not a significant expansion in the education and health services associated to the program. Part of the rejected contribution would be destined to investments in health. In fact, the largest part of the program's funding is destined to monetary transferences, leaving 10% for administrative and other expenditures, with no specific resources for the so called complementary actions and social services. But the expansion of services is urgently needed, especially considering that public health and education systems operate precariously in Brazil, facing problems both of quantity and quality. Conditionalities are an important trait of Bolsa Família: families eligible for the benefit get it if the children from 6 to 15 attend school regularly and small children and pregnant women use the predefined health services. The idea is that the conditionalities allow access to exit doors, at least for future generations. Undoubtedly, the effectiveness of the conditionalities depends, in its turn, on the availability and quality of the services provided. A quick evaluation of the basic education and health services in Brazil shows, however, how critical is its provision. As we know, access to public basic education and health in Brazil is de jure not dependent on the socio-economic condition of its potential beneficiary. Yet, along the last four decades, together with its expansion, the quality of the basic services went down and the middle class practically exited the system, probably causing an additional loss in quality, plus a worsening in social inequality due to opportunities segmentation. Evidence of this quality loss movement is the end product of the Brazilian educational system, considered sub-standard. In the standardized exam conducted by OECD in 2006 - PISA - among 57 countries included, Brazil was 52nd in Sciences and 49th in Reading ability; in Mathematics, in 2003, Brazil was last. The same is true of the health system. Since the 1988 Constitution, the system was deeply restructured, with universalization of access, decentralization and many important changes in the decision process; its decentralized model is considered paradigmatic. Despite these virtues, the amount of resources allotted to the system runs very much behind what would be required for its adequate functioning: the country spends 8.8% of its GDP in health (near the average of OECD countries - 9%), but its per capita expenditure amounts to half of that of the OECD countries, 1.500 dollars in terms of purchasing power in 2004.20 More important, the system is deeply segmented: families account for around half the expenditures in health (see WHO, 2007). Given the high income inequality among families, health provisions end up reinforcing social inequalities instead of compensating for them. Public provision is notoriously insufficient, and it is universally recognized that the basic system requires urgent investments to attend both the existing demand and the additional demand that may arrive through Bolsa Família. One must again recall that public investments in health were the major victims from the recent suppression of CPMF, for 50% of its revenue was destined to health programs. In sum, social services, besides being precarious, are jammed, unprepared to offer future generations credible expectations of emancipation from their families' poverty. In fact, it comes as no surprise that the first evaluations of educational indicators of the program's beneficiaries show that, in spite of the increase in school attendance, the educational performance of these children is lower than that of children who are outside it (Soares, Ribas and Osório, 2007). In face of such evidence, it is difficult not to have doubts in relation to the motives behind the program's conditionalities. Is their objective to turn the people into autonomous subjects, not depending on the benefits and capable of significant choices relative to their own well being?21 Or are the conditionalities imposed on the foundation that "there is no free lunch," that is, benefits must some way be compensated by beneficiaries, for someone is in fact paying for them? The difference is not negligible, especially if we want that policies in which we have interest are also instrumental for development. Both different points of view appeared in Brazilian public debate. Some specialists insist that the conditionalities are related to the principle that "there is no free lunch", and consequently demand for governmental monitoring obedience to them, and excluding recalcitrant families.22 Others observe that the non compliance with conditionalities may be related to the precariousness of the services,23 being, therefore, to some extent based in a coherent reasoning on the part of the beneficiaries. Government hesitated between the two positions and finally decided on monitoring the obedience to conditions, excluding from the benefits families that for five consecutive periods did not comply with them. This resulted in the first massive cancelling out of benefits since the program was inaugurated in September 2007.24 The closer monitoring required an expansion of the monitoring budget, but the precariousness of the services remained unaltered. Therefore, in spite of official statements that conditionalities exist in order to create future capabilities and allow for autonomous choices, they rested on heteronomy: a strong motive for the compliance seems to have been the fear of losing the benefit and not any gains expected from the children increased capabilities. From the point of view of development, the situation looks dramatic (although not so much from the perspective that "there is no free lunch"): on the one hand, the mere compliance with the impositions is not in itself an indication of increase in capabilities (because of the services' precariousness); on the other, keeping families in the program does not even warrant that they benefited from any service, for, when the service is not provided for unavailability, the conditionality is suspended. In other words, the program does not contemplate penalties for the government's failure in complying with its duty of offering adequate services. As we see, there is a need of increasing financial resources in order for Bolsa Família to in fact accomplishing its objectives. Yet, we saw above that there are pressures for the non expansion of the program's budget and that in some way these pressures may be endogenous to Bolsa Família in so far as, seen as a program for the poor, this reinforces the segregation principle and, with it, the ill will relative to pay taxes to finance it. Will it be possible to solve the dilemma "it's so little, but it's so much" inherent to Bolsa Família? It may seem that in some sense Bolsa Família must decide what kind of program it is: poverty relief or emancipation from poverty? Yet, this choice would not do away with the problem of political economy that is inherent to it: even if it were a simple program of poverty relief it would be large and expensive (still focusing only in families with children), involving substantial redistribution. In addition, if it does not offer concrete perspectives of social inclusion, it is easy to predict that its clientele will remain large and growing, and substantial redistribution would have to be kept for a long time. As a poverty relief program, we may predict it will have sustainability problems, if my hypothesis on the endogenous formation of tax preferences proves to be valid, that is, that the disposition to pay taxes to finance the program's expansion varies inversely with its degree of focalization. The program tends to shrink25 following the path of looking for efficiency in some of the secondary senses discussed in the first section, above. In fact, some program's advocates suggest that the government should invest in the register's improvement in order to eliminate leakages.26 And how about the turn to emancipation? In the short run, it would involve massive investments. Again, if my hypothesis on the endogenous preference formation is correct, it would be important not to segregate the investment on opportunities' expansion so that it could count on middle class support. But even this could prove not to be enough. For, if on the one hand the channeling of social services to the poor instead of their universalization (services already very precarious that, in practice, exclude the middle class) would increase the pressure against their expansion, on the other the amount of resources and the tax effort required for a really universal offer of high quality services would be forbidding. Considering that the country is not rich in terms of per capita GDP, it would have great difficulty in expanding the public provision of universal social services in adequate scale and quality, even with a greater tax effort. Our problem becomes now that of creating and expanding fair opportunities without segregation and, therefore, without compromising the program's sustainability, so that it will also be sensitive to the rhythm of growth of the resources to finance such expansion. Three steps seem to be required. The first flows from the assumption that "ideas" are relevant in the process of production and implementation of social policies: the way the policy is described and the doctrinaire repertoire to which it refers are important to attract support for them.27 In this case, I suggest that the Bolsa Família program should be described anew and, if possible, re-named as a policy for the development of fairness in opportunity. In addition to the important problem of segregation, this strategy would avoid the problematic association of the stipend as soft money (easy or uncontrolled money) that may be responsible for an ill will informally perceived in relation to the program's expansion. As an opportunity policy, on the other hand, it could be seen as providing economic security to families that fell into poverty (thus recalling that poverty is a temporary condition that could happen to anyone), besides extending other general opportunities to families that were confined in poverty. The second step is to re-orient the service component of Bolsa Família in the direction of a hybrid social policy - partly focused, partly universal - in order to win the support of the middle class the program runs the risk of losing, providing universal services with a priority rule. At least, the clientele's heterogeneity may be an instrument to reach the political and financial support the program needs, something like "I may not benefit, but I know someone who does." Thus, for instance, investments in education and health associated to the program would be open to everyone, but would be provided in such a way to impact first the poor, as the provision of day nurseries and children education and the extension of school days (including extra-curricular activities and courses preparing to advances in the school flux), beginning by public schools attended mainly by beneficiaries because localized in areas where they concentrate. Paradoxically, it may be easier to gain support to the program if it is more expensive - for its expansion in the "opportunity" dimension - than if it remains as a less expensive program, focusing only in income transfers to the poor. The third step is to strengthen Bolsa Família as a development policy that increases not only well-being but also capabilities. This step may require a re-evaluation of the policy of providing services and may impact both on the side of supply (disposition to pay) and on that of demand (requirement of resources) in the economy of Bolsa Família, as I explain in the next section. I will now consider the desirable orientation for the provision of services in connection with a development agenda. As already noted, some critics29 of the program argue that the money spent in it would be more profitable if used in the expansion of public education. In the literature on Welfare States, there is in fact some controversy as to the relative effectiveness of income redistribution and expansion of opportunities policies in terms of social inclusion (Esping-Andersen, 2007). Yet, this controversy makes more sense when referring to developed countries (and when the immigration question is not taken into account) than to developing countries for, in the latter, poverty often means absolute deprivation, including children under-nourishment, both chronic and acute. In the Brazilian case, research conducted by IBGE (2008) revealed that the profile of the beneficiaries is generally composed by people working in precarious jobs in the economy's informal sector, getting an income that is insufficient to satisfy basic needs. The income complement represented by the benefit is thus essential for some relief of some deprivations. Among them, the most critical is children under-nourishment, especially for it may permanently impair children's capabilities, generating, along the life-cycle, low educational performance and low ability to the exercise of other human potentialities. From the point of view of social policy, it is a complete disaster: under-nourishment in childhood is a secure indication of future social exclusion. Obviously, the expansion of the public system should also include substantial investments in the existing system in order to overcome its low quality problem. This system has also important provision problems that interact negatively with its service quality. Even at the fundamental level, despite the much applauded schooling universalization, the provision is not sufficient, especially if we consider, beyond the precarious infrastructure, the need to expand it to allow for the extension of the very short school days, a very serious problem of the Brazilian educational system that, unfortunately, was not taken into account either by the government or by social policy specialists in the country.31 These problems are partly responsible for the low educational performance of Brazilian students in standard tests. Should these programs focus on the poorer people? Leaving aside aspects of political economy and political sociology (legitimacy) and the expected interactions (the global effectiveness cost), focusing on the poorer children would in fact equalize opportunities, for children that are not poor do not have so restricted opportunities as the poor do. Yet, political economy factors may be important; in so far as they are, financing redistribution will get less support and will face growing difficulties, as indicated by the recent public debate. Social policy must be perceived as legitimate in a proper way, especially by those who will pay for it. As legitimacy depends on the policy style - particularly on its segregation characteristic - we may anticipate the difficulty in raising the necessary resources to level the playing field. A segregating social policy tends to reinforce the perception of a segmented society, and a segmented society tends to have recurring social exclusion problems. On the side of the effectiveness cost, evaluations that consider targeting better than universal policies in terms of equality promotion normally overlook important interaction effects, as those that occur in socially mixed schools and clinics. It is the effect of "rising standards". Schools that mix children of different backgrounds tend to improve the performance of poorer students without impairing that of the others once a critical mix is reached (Kahlenberg, 2003). Heterogeneous backgrounds are also useful in order to increase the communities' control over schools, for middle class parents tend to follow in a more active and effective way what goes on at school than do poorer parents. Finally, social heterogeneity allows children of lesser backgrounds access to non redundant social relation networks that may imply better future chances. These are empirical observations of great value for those that formulate public policies. Other effects, not directly testable, are also probable. For example, people who regularly share the same space tend to develop some relation, a sense of similarity that may help them to value their respective lives as equal. In very unequal countries like Brazil, the encounters of affluent and non-affluent people are fortuitous and some times, as in large cities, threatening. It looks at least doubtful that investment in a system practically segregated may generate the desired result in terms of good performance and better life chances for the children. Evidently, the expansion of education and health services along the lines suggested will represent very high investments. To give a conservative estimate, we calculated (Kerstenetzky and Alvarenga, 2008) the Brazilian social deficit comparing the average per capita expenditures in education and health in the country with that of other countries with better performance (Chile in education and Cuba in health) for 2005 and we reached a figure equivalent to 5.7% of GDP. If we concentrate only in pre-primary education, besides low per capita expenditures, the average rates of participation in Brazil are low, especially among families benefited from social programs. Less than 13% of the children up to 3 years and around 73% of those from 4 to 6 are enrolled in nursery schools and kindergartens (IBGE, 2008). The first thing one must keep in mind is that these investments have returns: the present value of future returns is much higher than present costs, as shown by estimates made by Esping-Andersen (2007). This author estimated the dynamic accounting of the provision for early education and concluded that the gains were larger than the costs in the long run, especially because the provision of child care and kindergartens allows for the increase in female participation in the labor market and to the corresponding increase in tax revenues. Another way of computing these gains is to estimate poverty costs or, more precisely, the direct costs and unregistered gains from children poverty, as Holzer (2007) did for the U.S. economy: around 4% of GDP is lost because of it (loss of human capital, expenditures with health and crime repression). It may be argued that the future is not here and that the estimate is counterfactual. Ultimately, perhaps, the decision should be taken on the basis of the perceived effects of social exclusion and of the sensible consideration that non effective policies are a loss of time, effort and money. Anyway, it seems improbable that a country like Brazil, neither poor nor rich, will be able to dispose, in the short run, of the resources needed to substantially change the structure of opportunities, even with an additional tax effort. Thus, one should not discard the mix of universalism and targeting in the additional provision of services in which the targeting component would not operate following a residual logic, and even less as a segregation principle, but as a priority rule in the expansion of social services, so as not to exclude the middle class and reach the poor first.32 A community approach instead of selective targeting (family by family) could work in this direction. The interesting consequence seems to be that targeting strategies within universalist schemes could help in making the system feasible, so as to reduce inequalities and overcome the distributive impasse. Back to the future, focus on children seems to be crucial in order for the country to reconcile itself with its future. 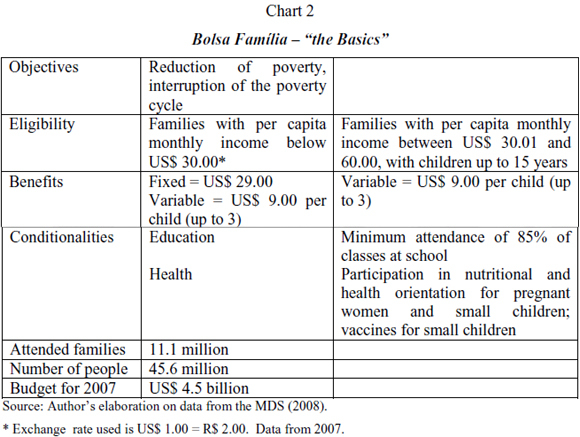 AIBF - Avaliação de Impacto do Bolsa Família [Bolsa Família Impact Evaluation] (2007). Cedeplar/UFMG/MDS. Available in http://www.mds.gov.br. BÉLAND, Daniel (2005). "Ideas and Social Policy: An Institutionalist Perspective". Social Policy and Administration, vol. 39, no. 1, pp. 1-18. CARVALHO, Mirela (2006). Direitos Universais, Gastos Focalizados: A Focalização como Instrumento para Universalizar Direitos Sociais. Doctoral dissertation in Sociology. IUPERJ, Rio de Janeiro. CNT/Sensus (2007). Pesquisa de Opinião Pública Nacional. Rodada 88, April 2-6. http://www.cnt.org.br/arquivos/downloads/sensus/relat88.pdf. DE GRAAF, Nan Dirk, DE GRAAF, Paul M., and KRAAYKAMP, Gerbert (2000) "Parental Cultural Capital and Educational Attainment in the Netherlands: A Refinement of the Cultural Capital Perspective." Sociology of Education, vol. 73, no. 2, pp. 92-111. DUARTE, Gisléia Benini, SAMPAIO, Breno e SAMPAIO, Yony (2007). Impactos do Programa Bolsa Família sobre os Gastos com Alimentos de Famílias Rurais, Universidade Federal de Pernambuco. http://www.bnb.gov.br/content/aplicacao/Eventos/ForumBNB2007/docs/impactos-do-programa.pdf. ENCARTE TENDENCIAS (2007). Revista Opinião Pública, vol. 13, no.1, pp. 219-229. ESPING-ANDERSEN, Gosta (2005). "Children in the Welfare State. A Social Investment Approach". Demos Working Paper, no. 2005-10. Political and Social Sciences Department, Universitat Pompeu Fabra. ___ (2007). Investing in Children and their Life Chances. Paper presented to the International Workshop Welfare State and Competitivity. Fundación Carolina, Madrid. April 26-27. FARKAS, George (2003). "Cognitive Skills and Non-cognitive Traits and Behavior in Stratification Processes". Annual Review of Sociology, vol. 29, pp. 541-562. GELBACH, Jonah B., and PRITCHETT, Lant H. (1997). "More for the Poor is Less for the Poor: The Politics of Targeting". Policy Research Working Paper no. 1799. The World Bank Development Research Group, Poverty and Human Resources. HACKER, Jacob S. (2003). "Privatizing Risk without Privatizing the Welfare State: The Hidden Politics of Social Policy Retrenchment in the United States", S, P & A, vol. 37, no. 6, pp. 639-655. HECKMAN, James, and CARNEIRO, Pedro (2003). "Human Capital Policy". Working Paper no. 9495. National Bureau of Economic Research. http://www.nber.org/papers/w9495. HOFFMANN, Rodolfo (2005). "As Transferências Não São a Causa Principal da Redução da Desigualdade". Econômica, vol. 7, no. 2, pp. 335-341. HOLZER, Harry (2007). The Economic Costs of Child Poverty. Testimony Before the US House Committee on Ways and Means. http://www.urban.org/publications/901032.html. IBGE - Instituto Brasileiro de Geografia e Estatística (2006). Pesquisa Nacional por Amostra de Domicílios - PNAD. Rio de Janeiro. ___ (2008). Acesso a Transferências de Renda de Programas Sociais. Resultados da Pesquisa Nacional por Amostra de Domicílios - PNAD de 2006. IETS - Instituto de Estudos do Trabalho e Sociedade (2008). Tabulações Especiais da PNAD 2006. http://www.iets.org.br/rubrique.php3?id_rubrique=12. IPEA - Instituto de Pesquisa Econômica Aplicada (2007). PNAD 2006 - Primeiras Análises: Demografia, Educação, Trabalho, Previdência, Desigualdade de Renda e Pobreza. Brasilia. KAHLENBERG, Richard D. (2003). All Together Now: Creating Middle Class Schools Through Public School Choice. Washington, DC, Brookings Institution Press. KERSTENETZKY, Celia L. (2006a). "Escola em Tempo Integral Já: Quando Quantidade é Qualidade". Ciência Hoje, vol. 39, pp. 18-23. ___ (2006b). "Políticas Sociais: Focalização ou Universalização". Revista de Economia Política, vol. 26, no. 4, pp. 564-574. ___ e Alvarenga, Livia Vilas-Boas Hacker (2008). Déficit de Oportunidades Básicas no Brasil: Uma Estimativa. Niterói, Universidade Federal Fluminense. Mimeo. KORPI, Walter, e PALME, Joakim (1998). "The Paradox of Redistribution and Strategies of Equality: Welfare State Institutions, Inequality, and Poverty in the Western Countries". American Sociological Review, vol. 63, no. 5, pp. 661-687. MDS - Ministério do Desenvolvimento Social e Combate à Fome (2008). http://www.mds.gov.br/bolsafamilia. OECD - Organization for Economic Cooperation and Development (2006). Program for International Student Assessment - PISA. http://www.pisa.oecd.org/pages/0,2987,en_32252351_32235731_1_1_1_1,00.html. ___ (2007a). Education at a Glance 2007. http://www.oecd.org/document/30/0,3343,en_2649_39251550_1_1_1_1,00.html. ___ (2007b). Health at a Glance 2007.http://masetto.sourceoecd.org/vl=12897833/cl=15/nw=1/rsvp/health2007/5-2.htm. SABOIA, João (2007). "Efeitos do Salário Mínimo sobre a Distribuição de Renda no Brasil no Período 1995/2005 - Resultados de Simulações". Economica, vol. 9, no. 2, pp. 270-296. SEN, Amartya (2000). Desenvolvimento com Liberdade. São Paulo, Companhia das Letras. SOARES, Fabio Veras, RIBAS, Rafael Perez, e OSÓRIO, Rafael Guerreiro (2007). "Evaluating the Impacto f Brazil's Bolsa Família: Cash Transfer Programmes in Comparative Perspective". Evaluation Note, no. 1, International Poverty Centre, Brasilia. SOARES, Fabio, et al, (2006). "Cash Transfer Programmes in Brazil: Impacts on Inequality and Poverty," Working Paper no. 21, International Poverty Centre/United Nations Development Programme, Brasilia. SOARES, Sergei (2006). "Distribuição de Renda no Brasil de 1976 a 2004, com Ênfase no Período entre 2001 e 2004". Texto para Discussão no. 1166, IPEA. ___ (2008). "O Ritmo da Queda na Desigualdade no Brasil é Adequado? Evidências do Contexto Histórico e Internacional". Texto para Discussão, no 1339, IPEA. UNDP - United Nations Development Programme (2007). Human Development Report. WHO - World Health Organization (2007). World Health Report 2007. http://www.who.int/whosis/database/country/compare.cfm?country=BRA&indicator=PcTotEOHHinIntD&language=english. ZEPEDA, Eduardo (2006). "Do CCTs Reduce Poverty?" One Pager no. 21, International Poverty Centre/United Nations Development Programme. * A first version of this paper was written when I visited, invited by Gosta Esping-Andersen, the Universitat Pompeu Fabra in Barcelona, during the winter, 2008. I thank Gosta for the reception and the comments and suggestions in frequent discussions. I also thank Manuel Villaverde Cabral for his invitation to present this work at the Instituto de Ciencias Sociais, Universidade de Lisboa, and the observations made during the event. I also thank for their comments Jaques Kerstenetzky, Rodolfo Hoffmann and Isabel de Assis. Last, but not least, I thank Antonio Lessa Kerstenetzky for his research assistance. None of them is responsible for the final result. ** This was the revelation that political support from individual members and parties of the government coalition was being bought, and paid on a monthly basis ("mensalão"), by politicians from the president's Worker's Party. 1 I adopt the conception of development as expansion of multidimensional capabilities due to Amartya Sen. See Sen (2000). 2 The Gini index is used to measure the degree of inequality in income distribution. It varies between zero, or perfect equality, and one, or perfect inequality (situation where one person has all income and the remainder have none). 3 A special issue of the journal Economica (2006) - "A Queda da Desigualdade no Brasil" ["The Fall of Inequality in Brazil"] - was entirely dedicated to the measurement of the phenomenon and a discussion of its determinants. 4 The yearly Brazilian fall in the period is estimated in .7 points in the Gini, higher than that observed in the U.S., France, Norway, The Netherlands, United Kingdom and Sweden in the periods of consolidation of their Welfare States. The Spanish fall in the period is of .9 of the Gini. 5 The program's reference poverty baseline was initially the official minimum wage, considering poor the family whose per capita income was below half a minimum wage; and very poor the family whose income was below a fourth of the minimum wage. However, the policy of raising the minimum wage above inflation rates may have been responsible for the governmental option for not indexing the program's poverty baseline to minimum wage. 6 In 2007, the government announced its intention of expanding the program to include youths of 16 and 17 of the benefited families as a response to high levels of school evasion in these age brackets. 7 That opinion was often reiterated by the editor of the newspaper of highest circulation in Rio de Janeiro, Ali Kamel. 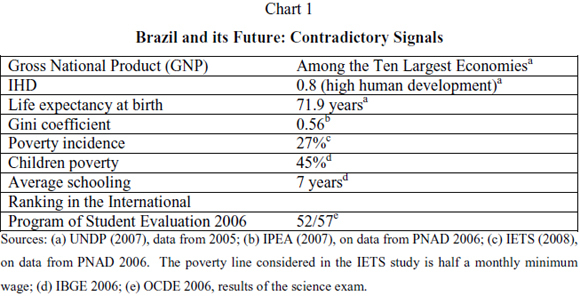 During 2008, after the publication of a research by the Instituto Brasileiro de Geografia e Estatística (IBGE) [Brazilian Institute for Geography and Statistics], that editor reaffirmed his point of view while denouncing that people who benefited from the program were buying electro-domestic appliances and that the government, instead of financing this kind of consumption, should invest in schools (O Globo, March 4, 2008). 8 The Commission's President, Bishop Aldo Pagotto, made that declaration during a collective press conference by the National Confederation of Brazilian Bishops (CNBB), November 17, 2006. See http://www.agenciabrasil.gov.br/noticias/2006/11/17/materia.2006-11-17.6055581924/view. 9 See, for instance, the interview given to O Globo (March, 29, 2008) by economist and demographer Eduardo Rios-Neto, of the Federal University of Minas Gerais, coordinator of AIBF. 10 The Contribuição Provisória sobre Movimentação Financeira [Provisional Contribution on Financial Movements] (CPMF) was created originally as a provisional tax (IPMF) in 1993 and recreated as a contribution in 1997. Before its rejection in 2007, the CPMF was a compulsory contribution of .38% on bank drafts and transference among accounts. Its objective was to finance public expenditures on health, social security and contribute to the Fundo de Combate e Erradicação da Pobreza [Combat and Eradication of Poverty Fund], important financial resource for Bolsa Família. 11 However, positive expectations about economic growth, increase in other taxes and a better control on tax evasion may help fulfilling the void left by the contribution's rejection. The basic problem is still the limited predictability of other funding sources. 12 Indirect taxes represent more than 50% of the total tax revenues in Brazil. 13 It is worth mentioning that, in an interview to O Globo (May 19, 2008), business representative Paulo Skaf, president of the Federation of Industries of the State of São Paulo (FIESP), declared that during six months (up to the decision that favored his side) he did his lobby in the Senate defending the rejection of the contribution. 14 The inclusion error is calculated as the ratio of the number of non poor beneficiaries to the total number of beneficiaries. The exclusion error corresponds to the ratio of poor non beneficiaries (eligible) to the total number of poor people (Soares, Ribas and Osorio, 2007). 16 Korpi and Palme (1998), for instance, observe that coalition formation and interest definition are conditioned by institutional characteristics of the Welfare State, particularly by its either focused or universalist orientation. They found evidence to support this hypothesis for the OECD countries. See also simulations of budgetary restrictions endogenously generated by focused policies that show how the available budget for redistribution tends to be smaller in a policy context focused on the poor (Gelbach and Pritchett, 1997). 17 This idea appeared in a workshop on income distribution at the Universidade Federal Fluminense (UFF) in 2007. It was espoused by economist Ricardo Paes de Barros, important specialist in social policy and former director of IPEA's social policy. See also Carvalho (2006) for similar arguments. 18 The combination of low benefits and short school day is probably behind the still high rate of child and adolescent participation in the labor market among families benefited by Bolsa Família. According to IBGE (2008), that participation was more than twice among families inscribed in social programs than among families not inscribed (14.4% against 6.5% of children from 10 to 14). 19 OECD (2007a). Figures are from 2004. 20 See OECD (2007b) and WHO (2007). Data on OECD countries refer to 2006. 21 This argument is problematic, for it assumes that people are unable to judge what is best for them. Why assuming that the beneficiaries would only enroll their children in school and take them to health services it they were materially compensated for it? 22 This position has been openly defended, for example, by economist José Márcio Camargo, a specialist in social policy, one of the creators of the Bolsa Escola program, that originated Bolsa Família. In 2005, he argued in this direction in a preparatory meeting for the World Development Report 2006, in Rio de Janeiro. 23 Soares, Ribas and Osório (2007), for instance, suggest that this problem may be important in what relates to the conditionalities of nutrition and health. They also suggest that the relatively low performance of students from beneficiary families may indicate problems of insufficient school quality. 24 Near 4000 families had its benefits cancelled out in September 2007 for this reason. 25 The program may shrink simply by not expanding, what could happen if the value of the benefit was maintained or with the eventual exit of beneficiaries. The use of indirect strategies of social policies retraction was very important, for example, in the U.S. after the eighties (see Hacker, 2003). 26 This has been the line of argumentation of Ricardo Paes de Barros and his associates. 27 The importance of ideas in the process of production and implementation of social policies is crucial, as shown by Béland (2005). Not only ideas about policies are important, but also the wider ideological repertoires from which they spring. In Béland's words: "political actors found themselves in [ideological] repertoires in order to construct descriptions destined to convince the people to support the public policy options they advocate". 28 I thank Gosta Esping-Andersen for directing my attention to the crucial question of early education. 29 A good many, including Ali Kamel, editor of O Globo. 30 There are interesting programs developed in many countries, among them the Americans Head Start and Perry Preschool, and the British Sure Start. Both the latter and Perry School go beyond services for small children and also involve their families through a number of services for the parents. Sure Start has an extended school program for poor children (essentially activities outside school hours). Some evaluations of these programs show the relative success of those that "invest" in the families, for these investments extend the effects of the interventions on small children (Heckman and Carneiro, 2003). 31 The important exception are researchers on education. For a critical view, see Kerstenetzky (2006a). 32 The opposition of targeting and universalism, with emphasis on the various senses of targeting, is discussed in Kerstenetzky (2006b).